Celebrate your faith with the 10kt white Devotion ring. 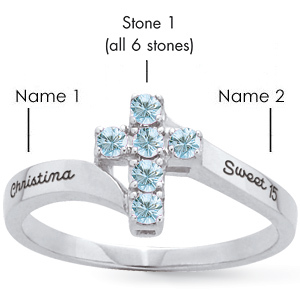 Select a color for all six genuine stones and engrave two names on the sides. Engraving areas 1 and 2 accommodate up to 10 characters. Each prong set gemstone is 2.0mm in diameter. Import.